The information below will help you navigate the two-factor security verification on your MyChart App. Use this computer login tip sheet whenever you need help. If you need any further assistance, please call us at 877-224-4430 Monday-Friday 8am-5pm and we will be happy to help. 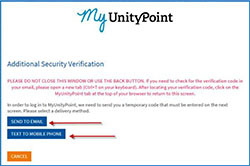 Access the MyUnityPoint login page and sign in using your MyUnityPoint username and password. An Additional Security Verification screen will appear. 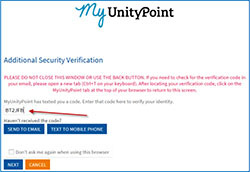 MyUnityPoint will need to send you a temporary verification code to use on the next screen to access your account. You can have this sent to you via e-mail or text message. Recommendation: send the verification code to another device if possible. If logged into MyUnityPoint on a computer, choose to text yourself the code. 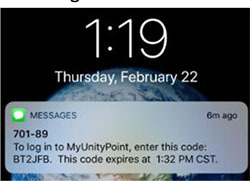 If you are accessing your account from your phone, email yourself the code and open it on a computer. Selecting Send to Email will send a message to the email address stored in your medical record. Selecting Text to Mobile Phone will send a text to the mobile phone stored in your medical record. Do not close the window after you have sent the code to yourself. Please Note: If you do not have access to two different devices, be sure to open the email in a new browser tab. To open a second browser tab, click the blank tab next to the MyUnityPoint window. Enter the code you received on the second Additional Security Validation webpage. To ensure you will not have to perform the verification code process again, check the ‘Don’t ask me again when using this browser’ box. This will prevent the verification process for 365 days or until the cache/memory is cleared on the computer. The verification process is device and browser specific. The verification process will need to be completed again if you use a different browser on the same computer, use a different computer, or use the mobile app. Click the Next button to proceed to your MyUnityPoint account.